This episode, we started off with Ren Zhong and Ruby Lin. To be honest, I was fearful. If you read my first impression post on We Are In Love, you would know that I thought Ruby was more than a bratty brat and the previews only scared me more. I was almost sure that Ruby Lin would pull out of filming this show entirely. Definitely not something to look forward to. Thankfully, this episode was so much better for this pairing. The awkwardness is the air is gone and Ruby is much more receptive to Ren Zhong even though she still cringes at his actions sometimes. To me, that is already a marked improvement and I am willing to accept her for who she is now. I was very pleased to see she wore the bracelet that Ren Zhong had gave her the previous day. At least she tries. Yay Ren Zhong! Things also got better because Ren Zhong might have finally done correct things that manage to please his 女神(nushen/goddess). Gotta admit, he is trying hard. I think his actions of making the girl feel like a princess and getting her to imagine dreamy stuff (wedding gown etc) would have melted most girls but unfortunately, his partner is not any other girl, Ruby Lin is a mature woman. This was also the first time Ren Zhong showed his unpleasant side. 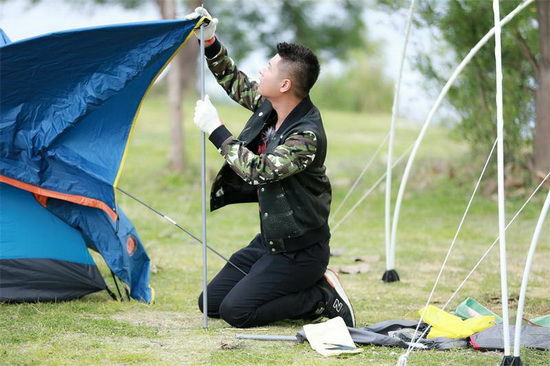 Instead of helping or talk nicely to Ruby when the kite’s string got tangled, he only made the situation worst. Other than that, Ren Zhong continues to be a sweetheart. I thought that him wearing the apron and cooking for Ruby was a brilliant move and I’m glad he managed to make her happy with that. Also, you gotta admit Ruby is horrible at playing Jenga blocks, who loses at the first round?! But, it was a fabulous activity because Ruby LOVED it. Her inner-kid was totally channeled out! And it proved to be good bonding time. I’m actually shipping this couple hard now! Ruby Lin feels like a complete different person by the end of her segment. This episode, she seems like she’s really here with the correct attitude to film a variety show and is willing to be touched by Ren Zhong’s little gestures. I loved that last scene where Ren Zhong shouted, “Ruby Lin, I am willing to peel prawns for you forever!” That’s basically a love declaration since Ruby said that when she was young, she once declared that, “If my boyfriend peels prawn for me, I’m going to marry him.” Oh you two. What a drastic change, rooting for this romance! >Ren Zhong offered chocolates to Ruby in an attempt to soothe her anger over the tangled kite strings but Ruby snapped, “I don’t like chocolates”. She was much more appeased when he produced a pair of scissors and cut the tangled strings away. Next up, we have Siwon and Liu Wen! I didn’t post about this couple the other time but I guess we didn’t miss out much since the segment of them in the past episode was really short. All we saw was some funny super junior members and 2 extremely shy but giggly participants surrounded by an awkward atmosphere. But they had pretty good chemistry and were kinda cute together. Liu Wen claims that this is her first romance and I really don’t know how much of that I can believe. She seems to be really shy and even dodged from skinship with Siwon in the first episode but I would have thought a supermodel like her should be more used to this? In this episode, Siwon and Liu Wen started off by going to a park and doing sweet couple-y stuff and taking pictures! It was funny because Siwon kept getting recognised and had to greet his fans (well, of course!) while Liu Wen started ‘being jealous’. I thought she would be more gracious because after all, she’s a supermodel and not very young anymore. In fact, she and Xu Lu are totally opposites. What I imagined Xu Lu to be materialized in Liu Wen and vice versa. It’s not a bad thing. It keeps things fresh and interesting. I can’t help but think Liu Wen would totally fall for all the gimmicks that Ren Zhong did for Ruby. But even without the cheesiness, shy Liu Wen seems to be very interested in Siwon, even talking about ‘helping him wash his laundry’ which totally means she wants to hang out at his house all day every day? Siwon does have a nice accent when he speaks english though and his chinese is surprisingly accurate despite being limited. It’s fine… quality over quantity, isn’t it? His car boot surprise was totally expected and it was cute to see him almost screw up but he can always blame it on the language so all is good! Liu Wen, on the other hand, was pretty disappointing during dinner when she answered, “I like to eat salad”. Does this prove the diet restraint of all supermodels? Despite all that, I found myself smiling unknowingly throughout the whole of their segment. My cheeks are starting to hurt now. Siwon seems a bit reserved but Liu Wen is playing the role of the perfect sweet love-drunk girlfriend for now. In fact, I feel that she’s taking this whole thing the most seriously out of everyone. Looking at the preview, Siwon will too prove his worth by upping his game the next episode. Looking forward. >Siwon surprised Liu Wen with helium balloons and a gift (dress) in the car boot while Liu Wen whipped up noodles with the help of restaurant chefs as a last minute present for Siwon’s birthday celebration. He finished the noodles even though he later confessed to the cameras that it was really bland. 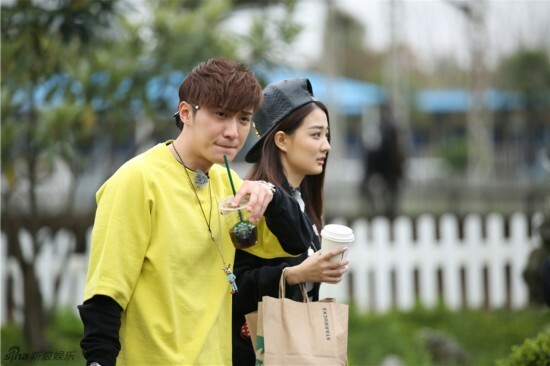 Finally, our resident cute couple – Kimi Qiao and Xu Lu! They are so adorable(!!!) Barely 3 minutes into their segment, I’m giggling from the sweetness and laughing out loud at the ‘jealousy’ going on. Xu Lu is indeed a thoughtful girlfriend, buying medicine for Kimi and Kimi is SO DUMB but I love him so much. I can’t do this anymore – the fangirl in me has completely eaten out the logical, calm and composed side of me. I’m back. And I finished watching this segment without noting anything down at all because I was too engrossed. You need to watch this on your own to understand how I feel! 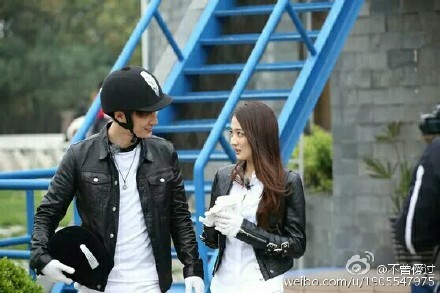 A quick round-up: Kimi brought Xu Lu to go horse riding but Xu Lu was afraid so he coaxed and taught her how to ride. They eventually ended up riding the same horse together (poor horse) and got squeezed really close to each other. After that, Kimi brought Xu Lu to the first eating place they found and it ended up to be a BBQ place which Xu Lu love and Kimi hate. Kimi can’t eat these kind of street food because he has a weak stomach but he persevered for Xu Lu’s sake. The whole segment was just pure love. Go watch it on your own! The preview for their segment is interesting though. 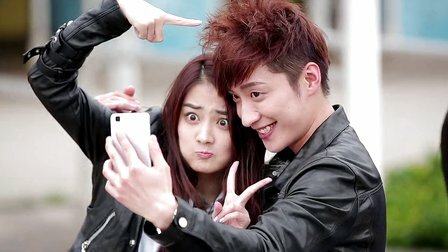 It introduces a new character -Guigui Wu YingJie- visiting and we get to see Xu Lu jealous for the first time! It ends with Kimi swooping in to kiss Xu Lu but I’m not very interested in that, it’s probably just the camera angle. >They had a water war while bathing the horse. >Kimi had asked Xu Lu where she wanted to eat, and she said “anything”. Hence, he brought her to the first food stall they saw. He had initially planned to name that stall “anything” from now on so it will also serve as a piece of sweet memory but he immediately regretted when he realised it was a streetside bbq stall (which he can’t eat at). 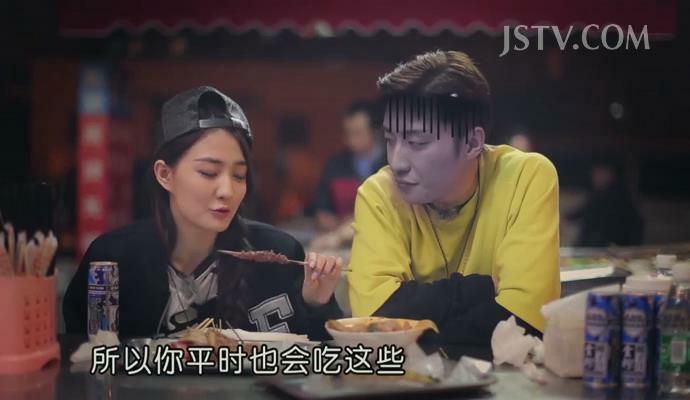 >Xu Lu, on the other hand, was quite disappointed at how casual he was, randomly picking a place but she ended up very happy because she loved street bbq. However, she still left without finishing the food after she realised Kimi can’t take them. Sweet and caring. That will be it for now. I initially thought that Ren Zhong and Ruby might climb up to be my favourite couple after this promising episode but it seems that Kimi and Xu Lu got that position secured. I had higher hopes for Siwon and Liu Wen because they looked really good and happy in the stills but their romance feels more like a k-drama than a variety show. Let’s see if my rankings will change next week. PPS: I didn’t actually take these screencaps on my own (haven’t really learnt how to…) but I promise I’ll improve next time round! They actually communicate mostly in english and communication doesn’t seem to be a barrier. Siwon has random quips in accurate chinese too so that’s pretty cool too! ah… i think to speak in accurate chinese is hard TT.TT maybe i just don’t have talent in learning mandarin.. its too many to remember and memorize.